I have recently been discovering the wonders of bamboo products. I'm in love with the way bamboo clothing feels on my skin. 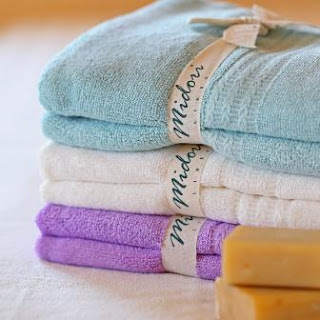 I also wanted to try some bamboo towels and Midori Linen is where I found a great selection. We got to try the Bamboo Hand Towels and the Bamboo Dishcloths. I am really loving these towels. I hung them in both our bathrooms to see if my husband would notice. They feel very different, extremely silky. At first he was skeptical of how they would absorb, they didn't feel very absorbent. Now we both love them! It feels different from a cotton towel, takes some getting used to. I personally love the silky feel, luxurious look, and the fact that they are actually absorbent and anti-microbial naturally. The set of 2 towels is on sale for $20.00 right now. 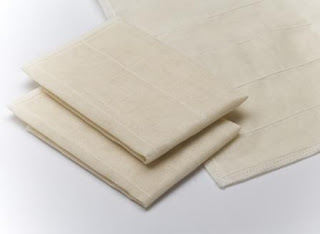 The Bamboo Dishcloth is great for dishes, that's exactly where you want an anti-microbial material. Unlike sponges, this cloth will not harbor bacteria. It is gentle on dishes, yet very effective at cleaning. Definitely a step above any cotton or microfiber dish cloths. The set of 2 cloths is only $6 and will last you a while. 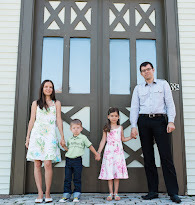 Midori Linen also carries some great bamboo baby products and adult bamboo clothing. A great one stop shop for all your bamboo wants and needs! MANDATORY ENTRY: Visit the Midori Linen and tell us what you would like to buy. Contest ends at 11:59 pm on Friday, May 27th, 2011. Winners will be selected using Random.org and contacted via email. Open to US residents 18+. I follow you and I would get the Two-Piece Bamboo Pajama Set. I have the pregnancy event button. I have the "Find a Stroller" button. I'd get some bamboo bath towels. I like the Babmoo Baby Hooded Towel. I follow you on Twitter, as janJ4C. I voted on the Picket Fence 5/19. I rated your blog on top Mommy Blogs. Iim a gfc follower and I'd get the bamboo spa towel set. I love the robe! I could only imagine it would be super soft! I follow and I love the Bamboo Cardigan Wrap!